Gas prices have dropped recently but that doesn't mean you can't still try and get the most out of a tank of gas. With a few simple maintenances you can boost or restore your fuel efficiency, getting farther than ever on a single fill-up. While several of these services can be done at home be sure to stop by your auto repair shop for any help you may need, as your local mechanic will be able to to assist you with additional methods to save gas! Internal combustion engines, such as the one in your car or truck, run on a mixture of gasoline and oxygen. If air can't get into the combustion chamber to mix with the fuel it will cause your car to compensate by burning excessive amounts of gasoline. To ensure this doesn't happen replace your air filter as needed to keep the oxygen flowing! The spark plugs are what create the tiny explosion that ignites the air/fuel mixture. If the ends of the plugs become dirty or corroded it can cause them to misfire, which is not only a waste of gasoline but it can can also cause additional problems, such as a rough idle. For every 1,000 miles traveled spark plugs fire millions of times, so it is easy to understand how misfiring can result in a large loss of fuel. Driving with underinflated tires can drop fuel efficiency by 25 percent or more! The engine needs to work harder in order make the soft rubber turn over and over. Your tire's PSI rating will be inside your owner's manual or in the driver side door jamb. Most gas stations have a free air check station, where you can also add air if it is found your tires are low. Make sure you always use the correct fuel grade for your car. High performance vehicles often need mid or high grade fuel in order to run properly, and using low grade gasoline will not only hurt your fuel efficiency but it can cause other engine troubles for your car. Modern vehicles should not need more than a few seconds after being turned on to be ready to drive. If your car needs a few minutes to hold an idle than your car is certainly suffering from some other sort of issue. Remember if your car is running but not going anywhere you're getting exactly zero miles per gallon! It is important to always complete routine auto maintenance as it is called for in your car's owner's manual as this will ensure a proper running vehicle that gets great fuel efficiency.! 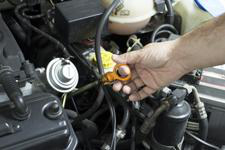 For superior auto maintenance in Covina visit Hye Tech Auto. Our team of professional technicians can assist with any auto maintenance or repair needed by your import or domestic vehicle. Give us a call at (626) 332-5452 to schedule professional auto service in Covina or the surrounding area.